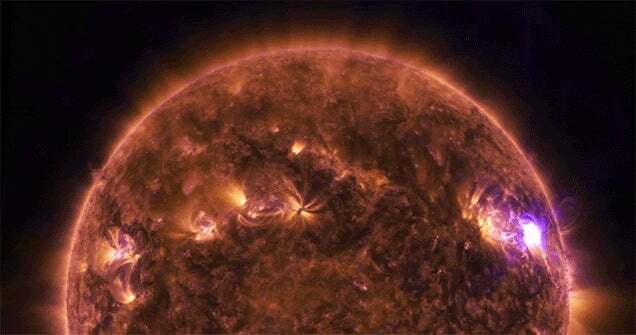 On April 17, 2016, an active region on the sun's right side released a mid-level solar flare, captured here by NASA's Solar Dynamics Observatory. This solar flare caused moderate radio blackouts, according to NOAA's Space Weather Prediction Center. Scientists study active regions — which are areas of intense magnetism — to better understand why they sometimes erupt with such flares. This video was captured in several wavelengths of extreme ultraviolet light, a type of light that is typically invisible to our eyes, but is colour-coded in SDO images for easy viewing.